The Centennial Weekend program began at the Derrick Motel at 8 p.m. on Friday, August 4. Donald J. Leedy, President, opened the Centennial Reunion events by ringing the Henry Clay Leedy bell, donated by Mary O. Hoover and Janet Gordon-Roach. Clyde and Marian Bowman shared some of their experiences as missionaries for over 10 years in Haiti and displayed some of the mementos they brought back with them. Wilma Racer showed many beautiful color slides taken during her trip to China some 7 years ago. She narrated the pictures by telling about her many experiences ranging from walking on the Great Wall of China, ornate temples and buildings, busy street scenes, and lovely scenery. During Friday night and Saturday, August 5, the Ankenytown area was deluged with 4 inches of rain from Tropical Storm Erin that had moved over Ohio from the Gulf of Mexico. As a result of wet grounds at Leedy Park, the Reunion business meeting and the traditional covered dish potluck meal was moved to the Township Hall. The minutes of the business meeting were recorded by Secretary Marian L. Bowman. The meal was served in the lower floor, following an invocation by Jack Davis. There was a long line because of the crowded conditions but wonderful food was enjoyed with a special feature, a delicious serving of roast hog provided by Craig and Connie Leedy. During the morning and early afternoon, there was a display of Leedy memorabilia in the upper level of Township Hall. One of the items presented was the original Aaron Leedy Garber printing press used for the publication of the initial editions of The Leedy Chronicle, loaned by the Ashland Historical Society. On display were issues of The Leedy Chronicle, badges and ribbons of previous Reunions, a Leedy Drum, a cradle from the Aaron A. Leedy family, and many pictures, scrapbooks, and personal genealogies. Full-sized paintings of male and female traditional clothing of the era of the first Reunion were on display for modern relatives to have their pictures taken, as if they were wearing these costumes. Souvenirs available for sale were the Centennial Badge and a Letter of Commendation to the Leedy Family in recognition of the 100th Leedy Reunion by the Ohio House of Representatives, through Representative Bill Harris. Television Channel 68 came from Mansfield to film people and activities in Township Hall, including interviews with Marie Swank Ashbrook Van Fossen (who was present for the first Reunion on September 23, 1896), Howard Bechtol, and Donald Leedy. The Reunion was shown on Channel 68 on August 8. Thanks to the generosity of the members and leadership of the Grace Brethren Church and special arrangements by Greg and Lisa Leedy Bluebaugh, the afternoon program was held in the sanctuary. Donald Leedy welcomed the Leedy family to its Centennial celebration. Chairman of the Trustees, Leonard Eugene Leedy, introduced the Trustees and reported on the work of the Trustees in maintaining the buildings and grounds of Leedy Park. Donald introduced James Conner, Vice-President, Secretary Marian L. Bowman, and Treasurer Stephen Leedy, who presented the financial report of the Leedy Reunion Association Inc. A collection was taken in the amount of $1,128.05. Historical information provided by Barbara Cruchon. - by Donald E. Beal, who brought Swiss flags and placed them on Leedy graves in Owl Creek Cemetery in memory of the Swiss origin of the Leedy family. The Leedy Reunion song, written by Roy B. Leedy, was led by Donovan Garber, accompanied by DeLee McNaul, pianist. The Honor to Veterans was presented by Laurie and Bill Hominick. Bill Hominick read the names and units of the Leedys who served as Union (56) or Confederate (16) soldiers in the Civil War. Corey Meyer assisted dressed in a blue Union uniform and then a Confederate shirt and hat. The "Ashokan Farewell" featured on the PBS series, The Civil War, was performed by Shirley Leedy, on dulcimer, and David Leedy, on violin. Those present who served during World War I or II, the Korean, or Viet Nam conflicts were asked to stand. There were none in the Gulf conflict. Donovan Garber and DeLee McNaul led the family in the song "America the Beautiful" as children in the audience came forward to display the American flag. For entertainment, Lynelle Leedy presented a lovely song, the quartette of Carole Humbert, Dan Leedy, Bette Murphy, and Wanda Robertson sang "This Land is Your Land," "Precious Memories," and "Red River Valley." Bonita Leedy Berkel gave a humorous poem, and Marvin Gerhart performed several rousing banjo solos. Donald introduced the "Beautiful Beard" contest and invited gentlemen to come forward. Five men displayed impressive beards of various lengths, colors, and styles. Voting by the audience made Raymond Simpson the winner by acclamation. Donald awarded Raymond the prize for the most beautiful beard. Two ladies modeled their lovely costumes, which were worn for the Centennial occasion. Special thanks to Rebecca Leedy Symanski who led the young children in games in the Church for 2.5 hours. The Reunion adjourned to the Township Hall for the auction of donated crafts and memorabilia. Special thanks to Lester Leedy for his wonderful woodworking skills evident in his donated items and to Raymond Simpson, the auctioneer who drew the best bids from the audience with skill and good humor. The Association received $468.25 from the auction with thanks to all who donated these wonderful items and those who purchase these bargains. The Saturday evening program began about 7 p.m. in the Banquet Hall of the Derrick Motel with a light buffet supper featuring sliced chicken, turkey, and beef for sandwiches, with a vegetable tray, macaroni salad, and chips. There were 109, not counting young children, who were in attendance. The hungry Leedys packed the Banquet Hall and shared the limited space with patience and good humor. Leonard Eugene (Gene) Leedy, to his surprise, was introduced and recognized for his long service to the Leedy Reunion Association as President, Trustee, caretaker of the Park when rented to groups, and faithfully supporting vital Reunion business, such as incorporation of the Association. Stephen Leedy, Gene's son, was Master of Ceremonies and introduced family members and Reunion Trustees who recounted some of their experiences and memories of Gene over many year's association as a faithful family man, friend, and worthy leader of the Leedy Reunion. Ruth Leedy provided an 1896 Indian Head Penny for Gene as a memento of the occasion. The evening entertainment was provided by Harry "Lead Fingers" Arter and his ragtime style piano. He and his banjo playing companion played old time favorites and led the group in familiar sing-along tunes. Russell Leedy thanked Donald and Shirley Leedy for their planning and work in leading the Centennial Reunion. Ruth Leedy presented Donald with a piece of leather harness with two sleigh bells to help him in getting the attention of the Reunion attendees. JoAnn's Video Scrapbook from Mansfield created a video of the evening for those who wished a permanent record of this event. At the close of this evening, a beautiful rainbow arched the sky, signaling God's promise for his constant care. On Sunday morning, August 6, the Leedy family joined with the congregation of the Ankenytown Grace Brethren Church for the morning worship at 10:30 a.m. Pastor Donald Farner welcomed all to the service. Greg Bluebaugh read the scripture and Tom Taylor-Leedy offered a prayer. Donald Leedy provided a statement of the history of the Leedy family and those Ohio family members who formed the "Leedy Church" in the German Brethren tradition for some 27 years before joining the new progressive Brethren church in 1883. Special music was provided by Lynelle Leedy. Pastor Farner delivered an inspiring message. President, Leedy Reunion Association, Inc.
President Donald J. Leedy rang the Henry Clay Leedy bell to invite everyone to come together for fellowship and the sharing of the bountiful feast provided by the family. Marvin Gerhart gave the invocation blessing this gathering. The auction was held following the delicious meal. Raymond Simpson served as auctioneer in offering many donated items featuring the woodworking skill of Lester Leedy. The decorative trays and boxes with inlaid colorful hardwood strips and velvet lining became the proud possessions of eager bidders encouraged by Raymond. The Association benefited by $305.25 from the sale of these items. Don opened the program at 2:00 p.m. with a warm welcome to the 120 registered relatives. The Leedy family Home Page on the Internet (www.leedyfamily.com) brought a request to locate Anthony Leedy, a U.S. Marine Corps veteran of the Viet Nam war. The family was invited to pass along any information about this Leedy. Marian Leedy Bowman, was introduced as the new President of the Leedy Reunion Association, Inc. Don turned over the Henry Clay Leedy bell to her safekeeping and use for Association business. Marion announced that the new Secretary is Laurie Leedy and the new Vice President is Tanya Shell. Treasurer Stephen E. Leedy and Historian Carole Humbert were reelected. Clyde Bowman was elected to another three year term as Trustee. Don introduced Roscoe Swank, Chairman of the Trustees, who discussed the efforts of the Trustees to maintain and improve the grounds and buildings at Leedy Park. The surroundings are changing from rural farmland to residential development with the sale in 1997 of the adjacent Porter farm. The widening of Yankee Street caused the removal of the Park fence, which will be rebuilt. Roscoe discussed the Association's intention to acquire some land from the current owner. While the Association was given permission to use some of that land for Reunion parking, the owner is unwilling to sell a small parcel at this time. Don urged everyone to register with their current address for the Secretary's record and future mailings. Historian Carole Humbert distributed a genealogical questionnaire. Jim Conner announced that additional copies of the Leedy Reunion Centennial Souvenir Cookbook were printed and available at this meeting. Jim also discussed the future project of putting The Leedy Chronicle on a compact disc (CD) for sale. In response to his request, individuals' interest in acquiring such a CD were demonstrated by a show of hands. Treasurer Steve Leedy presented the financial status of the Association as improving with outstanding bills paid and funds in a Park Account for maintenance, repair, utilities, taxes, insurance, mailing, etc., a Land Account for purchase of adjacent land, and the Book Account for a future history book. An offering of $465.00 was received at this Reunion. Steve thanked the family for its continued support. Don thanked Steve for his faithful stewardship of family funds. Lester E. Leedy was honored for his many years of faithful service to the Reunion. Lester was elected President a record five times and supported the Association by working on the Centennial, History, Nominating, and Tax exempt Committees. He is well known to those attending the annual meetings by his donation of many handcrafted articles created by his woodworking and cabinetworking skills, time, and fine hardwood materials. His pride in presenting his work to the family for their enjoyment and use is evident. Over the years his works have brought thousands of dollars to the Association and much pleasure to those in whose homes these products are now treasured. The family thanked Lester with a standing ovation and personal congratulations. Entertainment Chairman, Marvin Gerhart, introduced Shirley C. Leedy who led the singing of "The Leedy Reunion," by Roy B. Leedy. Silvia Glasco was recognized for her 91th birthday on August 9 with singing of "Happy Birthday." A message was received from Paul Stanton Leedy, age 90, sending his greetings to the Reunion. Don Leedy gave the following tribute to Aaron Leedy Garber, publisher of The Leedy Chronicle (1897 to 1927). Aaron Leedy Garber, Brethren minister and publisher of The Leedy Chronicle. "Aaron Leedy Garber was born in 1853, the son of Susanna Leedy, the daughter of Abraham Leedy, and David Leedy Garber, the son of Catharine Leedy Garber. In his early 20s, Aaron and his brother acquired a hand operated press and did job printing from their home in Richland County, OH. The brothers began a local newspaper, then Aaron moved to Ashland, OH and did printing for Ashland College and the Brethren Church. He built a flourishing business in general printing and religious publications. He joined the Leedy Church in Ankenytown in 1868 and was chosen a minister. He was active with the Leedy Brethren who united with the Progressive Brethren. Aaron continued to preach in area Brethren churches. Aaron was present at the first Leedy Reunion in 1896 and led scripture reading and prayer. The Reunion Committee met in December 1896 resulting in a decision to publish a monthly paper in the interest of the Leedy family named The Leedy Chronicle with a subscription of 35 cents a year and Aaron L. Garber as Managing Editor. Aaron edited and published this family newsletter as his personal service to the family from 1897 to 1927. The response from the family over these 30 years is a treasure of personal information about Leedy Reunions in Ohio, smaller Leedy Reunions in other states, pictures of Leedy relatives, poems, letters telling of travels, new homes and businesses in far off states, marriages, births, deaths, genealogical facts, biographies of Leedy settlers and religious leaders by Historian Roy B. Leedy, the successful effort to buy land for the Park and build the building that now shelters us, and much much more. Seeing their faces and reading their words of greeting, joys, and sorrows gives the reader a close encounter with the people who created our history and our heritage. We recognize his life as businessman, minister, husband and father, value the written record he left us, and honor Aaron Leedy Garber for his long years of service to us all." Marvin Gerhart introduced Lynelle Leedy who sang several sacred songs and inspired us with her messages of hope and faith. A quartet of Wanda Robertson, Carole Humbert, Bette Murphy, and Dan Leedy (sisters and brother) favored us with a medley of familiar and traditional melodies. Marvin and Dianne Gerhart entertained and inspired the family with their playing and singing. The 103rd Reunion was celebrated at beautiful Leedy Park on a clear warm day with fun, food, music, and fellowship. Join us for the 104th National Leedy Reunion on Saturday, August 14, 1999. The program followed a wonderful potluck meal with a great variety of delicious food provided by the family. Marvin Gerhart opened the program with prayer. Marvin and his wife, Dianne, sang Calvary's The Reason Why and He Was There All The Time. Marvin led the family in the Pledge of Allegiance and the Lord's prayer. Shirley Leedy led in singing The Leedy Reunion, words written by Roy B. Leedy to the tune The Church in the Wildwood. President Marian Bowman introduced Donald J. Leedy and presented him with a plaque in appreciation for his long and faithful service as Vice-President and President (1993-1998). 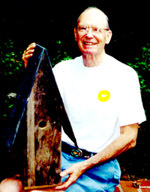 The plaque was mounted on a wormy chestnut wood fashioned by Lester Leedy from benches replaced after long use at the Park. Jim Conner, former Vice President, spoke to Don's work for the family and the Association, especially the successful Centennial and the improved financial situation. Don acknowledged the honor with thanks to the family. A quartet composed of Carole Humbert, Dan Leedy, Bette Murphy, and Wanda Robertson sang Home Sweet Home, written by Aaron A. Leedy, You Are My Sunshine, and Precious Memories. Dan Leedy sang the humorous The Preacher and the Bear. Oldest lady - Kathryn Conner, 92 in September. Oldest man - Galen Leedy, age 88. Farthest traveler - Kelly Bowen form Oregon. Youngest child - Cade Leedy Brubaugh, age 10 months. Lynelle Leedy sang The Basics of Life and Find Us Faithful. Leonard (Gene) Leedy presented the financial report on behalf of Treasurer Steve Leedy, and announced the donation for the day to the Reunion was $469.10. Historian - James B. Leedy, Jr.
Marian announced that Genevieve Bechtel is the winner of the contest to identify the names of Leedy family members appearing in unmarked photographs. Laurie announced the results of the silent auction, which had been held for lovely handcrafted items as $725.00 on behalf of the Reunion. A hearty round of applause was given for Lester Leedy, who donated examples of his craftsmanship, many made from the wormy chestnut wood from the Park that the Trustees had given to Lester. The program ended with music to an appreciative audience. Dianne Gerhart sang You Light up my Life. Marvin and Dianne sang a medley of their favorite songs. Carole Humbert, Bette Murphy, and Wanda Robertson sang a medley of familiar melodies. The audience applauded all those who gave the family such inspiring and entertaining music. The 104th national Leedy Reunion was held in lovely Leedy Park on a cloudy day but the warm greetings and shared food and fellowship brightened the day with many smiles. Please join us for the 105th Leedy Reunion on August 12, 2000. The program followed another fantastic display of food provided by the family, which was enjoyed by all. A silent auction of donated arts and crafts was begun. Marvin and Dianne Gerhart sang You And Me Jesus and Satisfied With Jesus. President Marian L. Bowman led the Lord's Prayer and the Pledge of Allegiance. She thanked Genevieve Bechtel for the lovely flowers and the F.L. Garver family for refurbishing the podium. Marian announced that the T-shirts bearing the name The Leedy Family Reunion and the colorful logo were available. Sisters Carole Humbert, Bette Murphy, and Wanda Robertson sang Till We Meet Again. They were joined by brother Dan Leedy for You Are My Sunshine, Silver Haired Daddy of Mine, Mother, and Precious Memories. Dianne Gerhart sang Picture This. Shirley and Don Leedy played Amazing Grace on the dulcimer and led the group in singing. Shirley played and sang her composition Together Again. Shirley led the group in The Leedy Reunion Song, words by Roy B. Leedy. Marvin and Dianne sang Don't Forget To Pray For Me. Lynelle Leedy sang Pilgrims, Accept The Grace, and The Basics of Life. Don Leedy presented the story of The Youngstown Branch of the Leedy Family summarized as follows. Jacob Leedy, great-grandson of immigrants John and Elizabeth Lidi (Leedy) was a manufacturer and dealer in tobacco, cigars, and snuff in Baltimore, MD. When the Civil War began in 1861 Jacob Leedy and sons William Gillespie, Walter Franklin, and Joseph Stahl enlisted in the Union Army as drummers. All survived. After the War, because neighbors were angered over their Union sympathies, Jacob moved to Youngstown, OH to join sons Charles and Joseph in forming the Jacob Leedy & Sons, tobacconists. Other offspring who moved to Youngstown were Walter Franklin, Helen Lucretia, Anna, J. Henry, Catherine and John. Jacob organized the Leedy Drum Corps, including five sons, that for two generations were featured in parades. The corps performed in parades for Presidents W.H. Harrison and Benjamin Harrison and President Garfield's funeral procession. Jacob and Catherine celebrated their 60th wedding anniversary attended by 80 relatives and friends. William Gillespie, tobacconist, who had seven children; Walter Franklin, carpenter, who had six children; Joseph Stahl, who had four children; Anna Matilda Leedy Yates who had two children; Charles Leonard, tobacconist, who had three children; Jacob Henry, carpenter, who had three children; and John Leedy, machinist, who had three children. William Edgar, realtor and Chairman of the Youngstown Metropolitan Housing Authority, the Nation's first slum clearance program, and an aviation enthusiast; Jacob Harvey, fireman and painter of landscapes who founded the Mahoning Society of Artists; and Charles Armor, journalist, actor, humorist, tapdancer, magician, and whistler. Marian Bowman displayed and rang the Henry Clay Leedy bell, presented by Janet Roach-Gordon and Mary Hoover, which is used for the Reunion proceedings. She thanked Arnold Leedy for providing the new Reunion sign by the Park entrance. Historian Jim Leedy stated he had 40,000 names in his Leedy History file with 20,000 more to be entered. He predicted completion in 2 years, provided he receives some assistance in entering information. He has created a CD containing Leedy pictures. Jim Conner and Don Leedy explained that the attempt to create a CD of the The Leedy Chronicle was not successful. Trustees continuing are Roscoe Swank and Marvin Gerhart, a new Trustee is Stephen Bechtel. Marian thanked the Trustees for their hard work and dedication in maintaining the building and grounds. Marian presented gifts to Arthur F. Merrin, from the State of Washington, who traveled the farthest to attend, Kathryn Connor, 93, the oldest relative present, and Heather Leedy, 8 weeks, the youngest. Treasurer Steve Leedy announced that the collection was $487.10 and the proceeds from the auction, all donated to the Reunion, was $960. Many thanks to those whose skill produced the items. Lester Leedy donated many lovely examples of his woodworking craft, which are now cherished possessions of the successful bidders. Clarence Leedy handcrafted a unique birdhouse using slate roof and original wood from the "Brick House" built by Aaron A. Leedy in 1870. Don Leedy made the winning bid for this family connection to, Aaron, his great-grandfather, and his father, Walton, who was born in that house. Marian Bowman led a benediction to end the program. Family members continued to enjoy the music of the Gerharts, view the historic pictures on display, and greet each other in friendship. The recorded attendance was 132 on a beautiful clear summer day in lovely Leedy Park. The weather offered a glorious sunny and warm day in beautiful Leedy Park for another meeting of the Leedy family. Following the singing of the Doxology, the famous Reunion meal was shared featuring delicious foods provided by family members. A silent auction of donated crafts was begun. Marvin and Dianne Gerhart played and sang a medley of inspiring gospel music. President Marian L. Bowman rang the Henry Clay Leedy bell to officially open the afternoon events. She led the family in the Lord's Prayer and the Pledge of Allegiance. Shirley Leedy led in the Leedy Reunion Song, words written by Roy B. Leedy, and Faith of Our Fathers. Pearl Ruth Leedy Martin, Margaret Lyda Byrd, Virginia Norman Leedy, Janet Leedy Gordon-Roach, John W. Leedy, Cecil Vaughan Leedy, Arnold Leedy, Gordon Montgomery Connelly, Reta Brubaker Ridenour, and Eulala Amos. Donald Leedy honored Gordon Montgomery Connelly, former Leedy Historian, the editor and publisher of The Leedy Family History (1985) who volunteered his genealogical services for over 30 years. Gordon died on June 1, 2001. Arnold Leedy reported the horseshoe player winners were Greg Leedy and Gene Leedy. The players donated entry fees to the Reunion. Trustee Clyde Bowman described improvements needed for the Park. Historian James Leedy reported on his entry of 48,000 names with 20,000 more to go in preparation for a future Leedy History. He is working on tracing the origins in Switzerland of our immigrant ancestors, John and Elizabeth. James will accept new names for the History until April 2002. Lynelle Leedy sang Thy Word is a Lamp Unto my Path and May Those Who Come Behind us Find us Faithful. Treasurer Stephen Leedy reported a donation of $100, a collection of $713.53, and auction proceeds of $584, all to benefit the Reunion. Donald Leedy described the story of Ulysses Grant Leedy who created the biggest and best drum company in the world. Ulysses, born in 1867 in Ohio, acquired at age 7 a drum carried by a Civil War drummer. He loved that drum and he played that drum! When he played near a railway station, passengers donated nickels and pennies to the small boy with the big drum. As his musical interests and skills developed, he played in the Fostoria, Ohio drum corps, the town band, and orchestra. Ulysses got a break when his xylophone performance earned him a chance as a substitute drummer at the Cedar Point Resort at Sandusky, Ohio. He said he was "scared to death" to play before such large audiences and to replace a well-known percussionist. In spite of this concern, he did so well he was invited back. Ulysses progressed from regular band member, to featured performer, and to theater drummer. In the era of the silent movies, the theater drummer used a variety of skills to provide the sounds of galloping horses, gun shots, closing doors, train whistles, etc. In 1896, he invented and patented the first folding drum stand and built his first drum. He continued to perform to support both his new wife and his new business in Indianapolis, Indiana. He made business contacts for his drums and accessories with performers passing through Indianapolis. Ulysses incorporated the Leedy Manufacturing Company, diversified into xylophones, chimes, bells, and whistles and developed catalog sales to reach performers wherever they were. As business grew, he added capable employees for specialized functions (e.g., cow hides for drum heads, wood drum shells, and metal parts and fittings). The company constructed a 7-foot drum for Purdue University, which is maintained and still played as the World's Largest Drum. The increase in movie houses created a need for theater drummers and more business for the Leedy Company. A new modern building was erected in 1909. Ulysses was the person who made everything work! Following World War I, sales doubled, the factory was expanded, and Ulysses developed a network of dealer relationships where travelling salesmen/performers serviced the dealers to demonstrate the quality of Leedy instruments and accessories. In the 1920s, the Leedy Company was the world's largest drum company. Virtually every professional band and theater performer used Leedy products. By 1928, the introduction of movie sound systems finished the role of the theater drummer. Ulysses' health concerns and increasing competition from other instrument companies caused him to sell his business to the Conn Company, which continued to produce instruments under the Leedy name after his death in 1931. The little drummer boy developed into an expert performer, band leader, an innovative developer of instruments and accessories, a successful business manager, a terrific publicist and promoter of the use of his musical instruments, and a friend to many performers who, like him, were making their way in a challenging and competitive music industry. 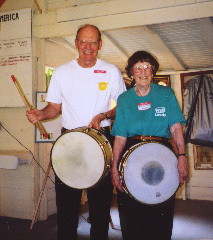 Mary Isabel Leedy Hampton, the daughter of Ulysses Grant Leedy, joined Don Leedy in displaying Leedy drums. Tanya Shell provided prizes to the oldest woman, Kathryn Conner, the oldest man, Galen Leedy, and the youngest child, Sawyer Leedy Brubaugh. Magician Jim Conner, assisted by Ryan and Cassie Leedy, presented a demonstration of baking sugar cookies from a recipe in the Leedy Centennial Cookbook. The baking process proceeded with mixing of surprising ingredients, then a display of color, fire, and noise for the amazement and entertainment of the audience. Songs were presented to an appreciative audience by Lynelle Leedy and Greg Brubaugh and a family quartet of Carole Humbert, Bette Murphy, Wanda Robertson, and Danny Leedy. Marvin and Dianne concluded the program by playing and singing in their own heart-to- heart style. President Marian L. Bowman invited everyone to return to Leedy Park on August 10, 2002, for the 107th National Leedy Reunion. August 10, 2002 2 p.m. The 121 members of the Leedy Family registered for the 107th National Leedy Reunion at Leedy Park in Ankenytown, Ohio enjoyed a beautiful sunny day and a wonderful feast at the potluck noon lunch. Marvin and Dianne Gerhart provided their Heart to Heart Gospel music as background. President Marian Leedy Bowman thanked the Gerharts for their music. She offered a prayer and led in a recitation of the Pledge of Allegiance to the Flag. Shirley Leedy led in the singing of The Leedy Reunion and Faith of our Fathers. Don Leedy gave the annual memorial to Leedys and spouses who have died: Robert W. Leedy, Loomis C. Leedy, Jr., John Leedy, Dale Inks, Charles Devoe Leedy, M.B. Leedy, Erin Catherine Leedy, June Kibler Leedy, and Walter H. Kunkel. Leonard Eugene Leedy presented the elected Officers: President, Dan Leedy; Vice President, James B. Leedy, Sr.; Secretary, Donald J. Leedy; Treasurer, Stephen E. Leedy; and Historian, James B. Leedy, Jr. Trustees continuing in office are Harold Bechtel, Steve Bechtel, Clyde Bowman, Marvin Gerhart, Clarence Leedy, and Roscoe Swank. Greg Blubaugh was welcomed as a new Trustee. Trustee Clyde Bowman gave special recognition to Trustee Roscoe Swank for his dedicated service to the Reunion. Clyde thanked the Trustees for maintenance of the Park grounds and buildings. He said that the Reunion had unanimously voted to improve the current well and provide water to the building. Historian James Leedy stated he had over 61,000 family member names in his computer and will use a software program to begin the layout of a Leedy Family History. He provided his new e-mail address as jleedy@comcast.net. Music was provided by Shirley Leedy and the brother and sisters quartet of Carole Humbert, Dan Leedy, Bette Murphy, and Wanda Robertson. Donald Leedy presented The Man They Call Uncle Isaac, the life and times of Isaac Leedy of Ankenytown, Ohio (1827-1915). Isaac was born in Morrison's Cove, Pennsylvania, on December 23, 1827, the son of Abraham and Elizabeth Leedy. As a child he was part of the 1829 Leedy migration to the settlement in Knox/Richland Counties, Ohio. In addition to the common family heritage, these pioneers shared the German language and the German Baptist religion. He grew to manhood on the farm developing mechanical skills in his father's blacksmith shop. His formal education was limited to basic reading, writing, and arithmetic in log cabin schools. He was considered a master as a blacksmith, carpenter, and mason. Beginning as a renter, he purchased a farm in 1859. During the next 30 years he repaired buildings, replaced fences, removed tree stumps, cleared more land, and raised many crops - at the cost of hard physical labor. Isaac loved fine stock and purchased the best available. He raised and sold Percheron horses (a large and strong French breed) and Black Orpington chickens (an English breed noted for meat and egg laying). Isaac enjoyed social life with company and neighborly visits but was strict in his personal habits. He wrote "I never paid a nickel to satisfy the cravings of the tobacco devil" and described his position on a county prohibition option as "Glory to God of all nations that he gave me the happy privilege of using my voice and ballot to dry up all the saloons in Knox County." He married Nancy Bostater in 1851. To them were born four sons and six daughters with five children preceding their mother in death. Nancy died in 1866 leaving a sorrowing Isaac and a child four days old. Perhaps there was family matchmaking going on to help Isaac and his children. Lovinia Wolf came from Indiana to Ohio for a visit. Later that year Isaac and Lovinia were married. They had seven children, three of whom died at an early age. This was a husband and father acquainted with grief and personal loss but sustained by his religious faith. Isaac united with a German Baptist Church at age 30 but followed the small group of Leedy relatives and fellow believers who were expelled for calling for stricter observance of the ordinance of foot washing. This group formed a gospel church they named "The Leedy Brethren." Isaac was called to the ministry of this church in 1859. He accepted and seriously applied himself to study the Bible and to preach. He became an eloquent, forceful, and convincing speaker. Though never receiving compensation as a minister, he traveled to help organize and preach in new churches in Ohio and Indiana. He stood strong and faithful to his Bible faith and helped form a progressive element in what is now known as the Brethren Church. Isaac was one of the organizers of the Leedy Reunion. He was in the forefront of those with a vision of a national annual meeting of Leedy relatives, gathering of information for eventual publication of a Leedy history, planning for a permanent reunion site and building, and sparking the publication of a family magazine, The Leedy Chronicle. His face and voice welcomed those attending the first Reunion on September 23, 1896. Isaac's Address of Welcome and verse as published in The Leedy Chronicle was read by James L. Conner. Isaac Leedy encouraged attendance at Reunions and support of subscriptions to the Chronicle. He served as President and Corresponding Secretary. He urged the writing down of family history and providing photographs for the Chronicle. He wrote letters about family news and stories about pioneer life that were published in the Chronicle. He was a devoted husband and father who shared his religious convictions, and constantly encouraged family members in the creation and continuation of the Leedy Reunion. He was recognized for his leadership to the family so that when a Leedy referred to "Uncle Isaac" everyone just knew it was Uncle Isaac Leedy of Ankenytown, Ohio. Arnold Leedy announced the winners of the Horseshoe Tournament were Ed and Wayne Dawson. The players donated $50 to the Reunion. Laurie Leedy reported that the silent auction took in $424 for the Reunion and thanked the donors of those items. Treasurer Steve Leedy announced the family gave $460 for support of the Reunion and operation of Leedy Park. Leonard Eugene Leedy offered a tribute to Marian Leedy Bowman, who is retiring as President, for her years of devoted service to the Leedy family. The Business meeting was followed by another memorable pot luck luncheon provided by the family. Thanks to Genevieve Bechtel for the display of lovely flowers from her home. The Silent Auction was concluded at 1:30 p.m. and Laurie Leedy collected the money from each successful bidder. President Dan Leedy announced that a CD for the Leedy Chronicle has been prepared and will be made available for a donation to the Reunion of $20 or more. Historian Jim Leedy needs help to complete the History next year. Don Leedy read the names of the following family members who have passed away. John Leedy on March 9, 1999, he was the son of John Leedy. His wife, Helen, on April 25, 2003. They lived in Stuart, FL. Roger A. Smith on September 15, 2002, he was the son of William A. Leedy. 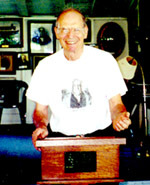 Merle G. Leedy, on October 2, 2002, he was the son of George A. Leedy. Mary Louise Leedy on November 16, 2002, she was the wife of Dory Dale Leedy who preceded her in death. Arlene Bechtel Kunkel, on May 23, 2003, she was the daughter Zella Ellen Leedy Bechtel. Galen F. Leedy, on May 25, 2003, he was the son of Homer Leedy. Lois Arlene Elliott on March 23,2003, she was the daughter of Carrie Alice Leedy Young. Daniel Looney Leedy on January 20, 2003, he was the son of Charles Monroe Leedy. Othel Spurgeon Leedy on January 20, 2003. Ruth Edna Lindamood Leedy, August 15, 2002, the wife of Othel Spurgeon Leedy. Rupert Dean Leedy on January 29, 2003. Carl Dean Herbacher on February 20, 2003, the husband of Delores Jean Leedy Harbacher. Bertie Mae Humberger Leedy on April 4, 2003, she was the wife of Raymond Gleaves Leedy. James Allen Leedy, on April 11, 2003, he was the son of Raymond Gleaves Leedy. Janet Leedy on February 28, 2003, she was the wife of Roger Lewis Leedy who preceded her in death. Dan Leedy led the group in the singing of The Leedy Reunion written by Roy B. Leedy. Shirley Leedy and grandson, Austin Leedy, brought their dulcimers, Appalachian wooden stringed instruments. They played Boil Them Cabbage Down, a traditional mountain melody, Austin played The Eyes of Texas Are Upon You in honor his native Texas, and they played and led the Reunion in Amazing Grace. Marvin Gerhart played several rousing banjo solos. The quartet of Carole Humbert, Dan Leedy, Bette Murphy, and Wanda Robertson sang Lady in Blue, Let the Rest of the World Go By, Long Long Trail, and You Are My Sunshine. They were joined on stage by Olivia Leedy Hunter, Lauren Murphy, and Hunter Murphy who sang There is Only One America and You're a Grand Old Flag. The quartet concluded with What is Nicer Than a Home Sweet Home by Aaron A. Leedy. Dan Leedy entertained with a humorous reading of Duck Eggs. Lynelle Leedy sang Every Season. Treasurer Steve Leedy reported donations to the Reunion from horseshoe players - $45, Leedy Chronicle CD - $390, collection - $363.30, and Silent Auction - $1,188.00. Steve thanked the Reunion and those donating craft items for their support. When the East Coast was colonized, some new places were named after kings, the sponsor of the colony, or names of places left behind. There is a human urge to memorialize one's self by name. With the settling of the West and new towns being formed, some of our relatives took advantage of the opportunity to identify a new community with the name Leedy. The three communities that were named are: Leedy, Mississippi; Leedy, Montana; and Leedey, Oklahoma. This summer my wife and I drove through northern Mississippi following a U.S. map that showed a dot and the name Leedy. This is an area of rolling hills, pine wood showing signs of lumbering, occasional homes, and small Baptist churches, but no Leedy Post Office or signs pointing the way. The Leedy History states the town was originally named Berea but changed to Leedy by the Illinois Central Railroad. This Leedy was William Bibb Leedy, founder of a Real Estate and Insurance Company, a Confederate veteran who survived the war and imprisonment by Union Forces. The History credited William with bringing the railroad to Birmingham. My father, Walton, made a trip to Leedy, Mississippi long before I did and photographed the country store with its Post Office sign, U.S. flag, gasoline pump, and a Coca-Cola sign with the name W.B Depoyster. Mr. Depoyster wrote my father in 1958 that he had asked around and had come up with the name of Roy B. Leedy who was working on a family tree and might know about the Leedy of the town name. The Leedy Historian apparently learned something the local residents did not know. The country store in the photograph now has no flag or Post Office sign, but still sells Coca-Cola and welcomes travelers. We were directed to a location a few miles away that was identified by a resident as "The Leedy Community." We were told that there were no Leedys living there but there once had been a barrel factory. The railroad still passes through the community. While there is no posted sign of Leedy, Mississpppi any more, the name Leedy is recognized in the local community as a specific place representing home to residents and welcome to visitors. Leedy, Montana was founded by Schuyler Colfax Leedy, a cattleman who was the Post Master at the ranch in 1903. The published History shows five children born to Schuyler in Phillips County, Montana during the period 1898 though 1909. Leedy Montana cannot be found on the map as a result of the building of Fort Peck Dam completed in 1940, which impounded the Missouri River forming Fort Peck Lake. Amos did have another problem with the Post Office Department because he threw away some long unclaimed letters in his Post Office that were involved in some land contest cases. Keeping his Post Office neat and clean did not help as he had to pay a fine but other charges were dropped. That is the story about three towns named Leedy. The only one still in existence is the misspelled Leedey, Oklahoma. Chester Leedy provided a newspaper report of events that took place 100 years ago. The report told about the 8th Leedy Reunion. those coming the farthest - Michael and Belinda Bowman, from California. The program concluded another wonderful Reunion day at beautiful Leedy Park with 121 recorded in attendance. Please come back for the 109th Leedy Reunion the second Saturday in August 2004.